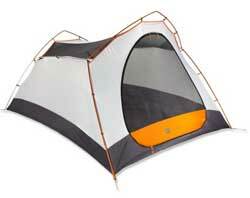 The Hoodoo 3 rates an average of 4.5 stars across 53 reviews, and $200 is a fair price for a tent in this range. It’d be a stretch to get 3 adults into a tent this size, but two grownups and a small dog might fit, or a mom and two kids. It has a spacious fly that creates a good front vestibule, and it has a back door and vestibule so you can stow some gear back there that you might want to grab in the middle of the night. The pole setup looks a bit more complicated than I’d prefer, but if there’s two of you it shouldn’t be so hard to figure out. (Foolproof relationship test: if you can get a tent up without hating each other, it has promise). I’ve had fine luck with two REI tents — they’re sturdy and reasonably easy to set up. And the great thing about REI: if you don’t like, you take back, and they accept your return with a smile . ← Woo-hoo, We’re No. 2! I saw one set up at the Marina store, and picked it up on the spot. It was big enough for us and two dawgs, the vestibule held the chair, and t – showers were repelled, leaving us warm and dry. For the price ($250 at the time), you won’t find another tent with as many features, or as cozy. My brother and I bought this tent at REI Saratoga during the summer clearance sale. It was $179.99. We hope to use it as a 2 man, but we’ll let a third join us on short trips.